We partly discussed Ghost 11.5 in one of your previous threads. Does the CD boot in your computer? Is your Win10 installed in Legacy or UEFI mode? 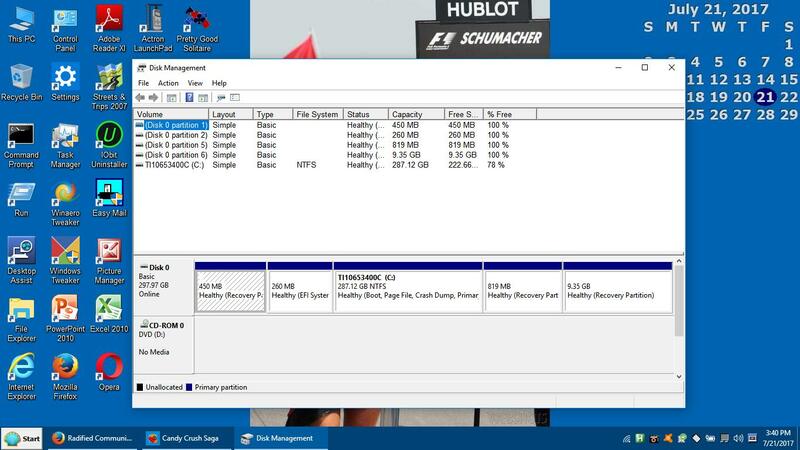 Can you tell us which partitions are present in Disk Management? This will help in knowing whether Ghost will work. Great screenshot. That partition layout indicates the OS in installed in UEFI mode. Ghost 11.5 doesn't support GPT disks and while it appears to backup the disk, the restored image isn't bootable. Regarding Secure Boot. Why it it disabled? It protects against the current ransomware. In your screenshot the 9.35 GB rectangle is the fifth rectangle but in the text at the top it shows as Disk 0 partition 6. This is because Disk Management does not show the Microsoft Reserved Partition which is positioned after the EFI System Partition. On the Windows RE location: line, what is the partition number? Note: This laptop originally came with Windows 8 and was then upgraded to Windows 10 using the free upgrade provided by Microsoft. Personally, I do not delete system partitions unless I absolutely need to and I am sure it will not mess something up. Thanks. Your Recovery partition is the 819 MB one. Partition 1 is redundant. If you ever need extra space for your OS partition you could delete Partition 6 and add that space to the OS partition. But have the system imaged just in case you make a mistake. Which imaging software will you use for this UEFI system? You have a GPT disk, not a MBR disk. Your OS is installed in UEFI mode. It boots in UEFI mode whether Secure Boot is on or off. If by standard boot you mean MBR, you don't have it. Secure Boot prevents unauthorized boot code from running. For example, some of the recent Ransomware malware. Brian, No intention of deleting any partitions at this time. Ghost 15 doesn't work on Win10. SSR 2016 works but I'm not sure about SSR 2013. Acronis TI works but it has the worst reputation of all imaging apps. Buggy. Do you prefer online or offline imaging? How often would you image? I prefer imaging with no programs running, like how the original version of Ghost worked. It booted back to PC-DOS or in some cases, MS-DOS and then made the image. As to how often, I usually make an new image when a major change has been done. Say Windows 10 updates to a newer version, or lots of new programs have been added or updated. So maybe every couple of months or so. Data files I copy to another location now and then. Then I suggest you trial Image for Linux. GUI version. It works with Linux and Windows OS. It's fast, reliable and is updated about five times per year. Licensed for 5 home computers. Initially, I'd use Simple Operations mode. Three clicks to backup and three clicks to restore. It doesn't get any easier than Simple Operations Mode. I've been using Ghost in one version or another to backup and/or clone hard drives since 1997. Today, have Ghost 11.5 (DOS Version) on both CD's and Flash Drives. I use it to back up everything, from XP to Win-10 Pro/64. It doesn't seem to care what the OS is. My software guru says he uses it to back up his Linux Server. Sometimes booting into Ghost from a Flash Drive works better than booting from a CD, and vise versa. So I keep both media handy. I never cease to be amazed at how old things work better than newer things.... backup programs included. Cheers Mates. It's nice to see that some folks still use Ghost. Have you tried Ghost 11.5 (DOS Version) with a UEFI system? That would be good if OldCasper can tell us if Ghost 11.5 will work with the Windows 10 Creators update and UEFI type BIOS ... Just because it creates an image, does not mean you can restore it. The UEFI BIOS might stop you. But I suppose you could always boot into the BIOS and change it to Legacy to do the image restoral and then change it back after it works. Note: Ghost 11.5 does not support a USB Keyboard or Wireless USB Mouse (at least not on my Dell Dimension 8200) not sure how to get around that except to have old style keyboard and mouse around.